Earlier this December we got the tree up and cooked up a melange of festive treats for our annual Christmas supperclub. Initially we’d picked the new Rick Stein ‘Road to Mexico’ book as our inspiration, to give a bit of a Central American twist to the traditional festive fare. However once we’d seen the book and accompanying series we were disappointed to find it a bit dull (sorry Rick!). Cue Nigel Slater to the rescue with his very endearing Christmas Chronicles offering – a festive take on his gorgeous kitchen diaries. And so our new theme was born – apologies to those who were looking forward to Rick, I’m sure we’ll revisit him again sometime in the new year! The good thing about Nigel is that his recipes can be very simple but with some unusual and unexpected flavour combinations. So hopefully our menu did not let down, especially as it tried to veer away from boring Christmas fare. We started proceedings with a cocktail that was two weeks in the making. Sweet muscat wine, brandy, sugar, orange peel, dried apricots and star anise were steeped for a fortnight. Nigel serves this chilled as an after dinner tipple, but we lightened ours with a bit of prosecco to make a very seasonal aperitif. Our canapés were mini versions of some of Nigel’s strong supper dishes. First up was a tiny version of his smoked fish pie. 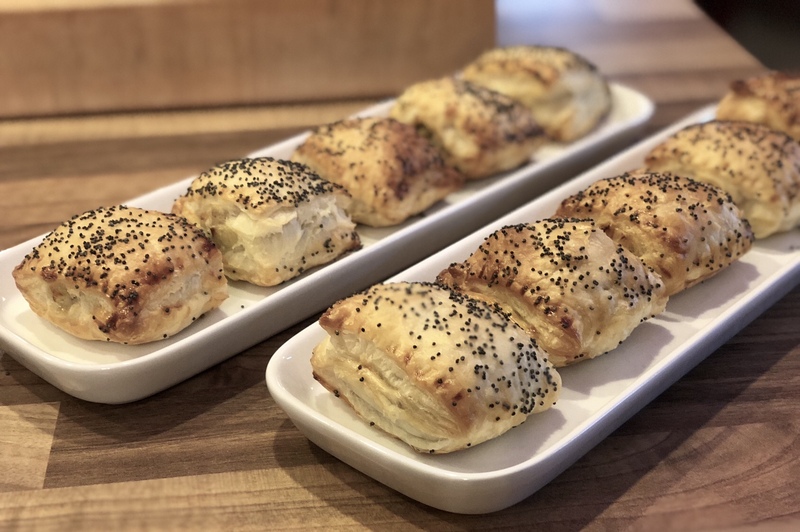 Rather than being topped with mash, these were little puff pastry parcels filled with a filthy filling of smoked salmon, smoked mackerel, cream and tarragon. I massively over estimated quantities and so now have a few large ones in the freezer ready for a rainy day! Second up were mini dishes of a leftover Christmas staple, bubble and squeak. This was brought bang up do date using sweet potatoes and Kale, paprika and chilli. To make this more luxurious, blue cheese was added to the mix and this was all topped off with a fried quail egg. 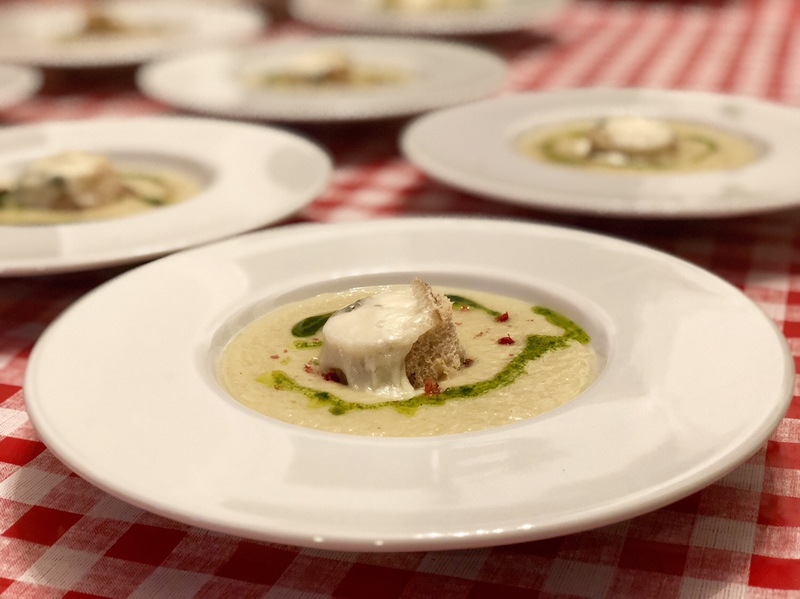 Our soup offering was a simple cauliflower and leek soup topped with a crouton of sourdough and toasted cheese. I made the soup a little more festive with the addition of chive oil and crushed pink peppercorn, which gave it a lovely peppery after taste. The crouton was homemade sourdough, courtesy of the fab course I did at Leeds Cookery School, and topped with Leeds Blue (a locally made Pecorino courtesy of our friend Mario Olianas, an award winning cheesemaker). Also for the second of the starters, we looked to Italy for inspiration. Susie made little balls of gnudi, a light dumpling made from ricotta and parmesan. These need a minimum of 24 hours chilling on a bed of semolina to to form a skin that holds the dumpling together. This is an important step as they will disintegrate upon boiling otherwise! 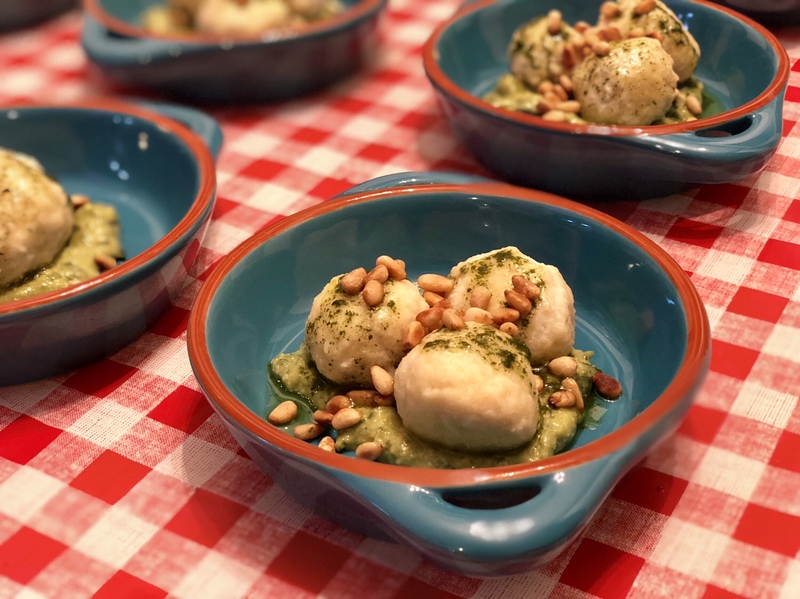 The dumplings were sat atop a herby pesto made of basil, pine nuts, lemon and avocado for extra richness. 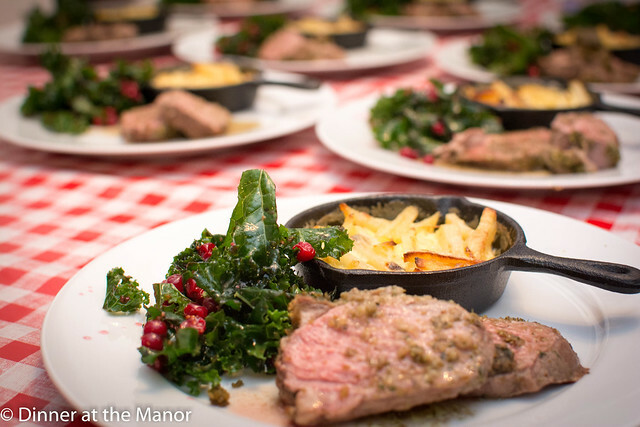 We served the best of the meats for our main courses, and no turkey was to be seen anywhere! First up was an amazing piece of pork belly from the guys at Tancred Farm. They’re based out York/ Wetherby way and are always at the Leeds farmers markets. They rear their own pigs and the meat is of an incredible quality and at competitive prices as you’re buying straight from the producer. I braised the belly in pear cider for 3-4 hours, pressed it overnight, marinated it in miso, mustard and honey and then roasted it until it was soft, charred and crispy round the edges. The pork was super moist and the marinade an amazing musky, umami – I’m putting it on everything from now on, it’s even good on a piece of meaty cod! It was served up with a lightly pickled pear, roasted slices of pumpkin, dukka (a dry nutty, seedy, spice mix), pork jus and crackling crisps. Very colourful on the plate and full of bursts of flavour. Our final meat celebration was a meltingly tender seared beef skirt from the wonderful butchers at Keelham Farm Shop which is literally on Susie’s doorstep. This was sat atop a mound of creamy, cheesy spinach polenta and then brought together with a fresh, zesty, herbed gremolata. 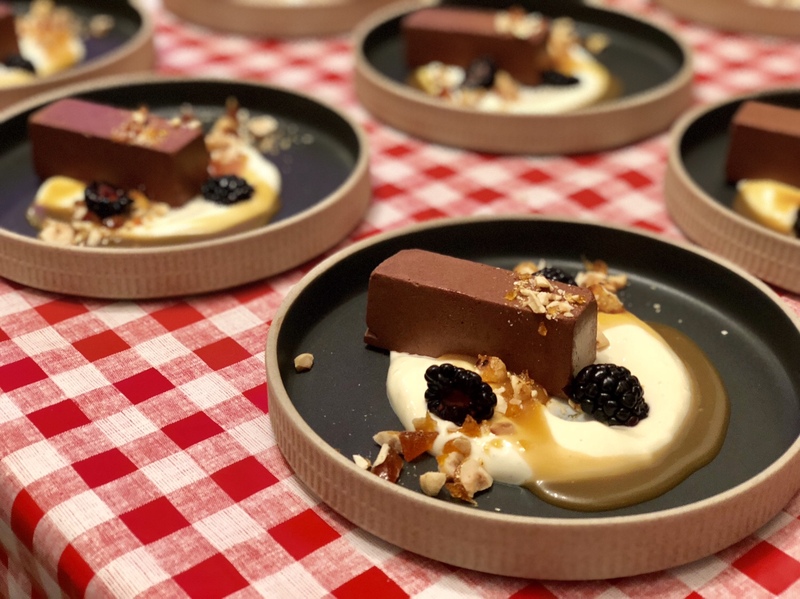 Our final course was Susie’s decadent Christmassy dessert of set chocolate mousse, which was served with a mascarpone cream, salted caramel sauce and hazelnut praline. A brilliant combination of rich chocolate, sweet caramel, creamy mascarpone and the crunch of the nuts and caramel. We’ve become a bit infamous for our not so petit fours (aka Grand Fours) and so not to be out down I rustled up Nigel’s fig and orange shortbreads. These are a cross between a fig roll and a mince pie. 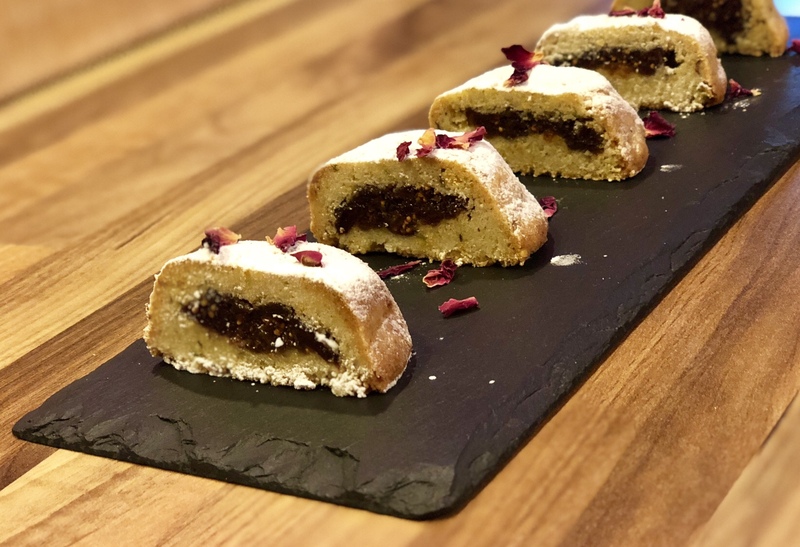 Essentially its a sweet, nutty, zesty shortbread dough with a figgy filling baked inside. They’re not too sweet and have a drier texture than a mince pie. 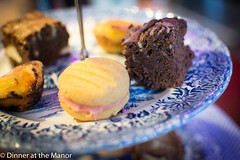 We served these in halves as they were so humongous! 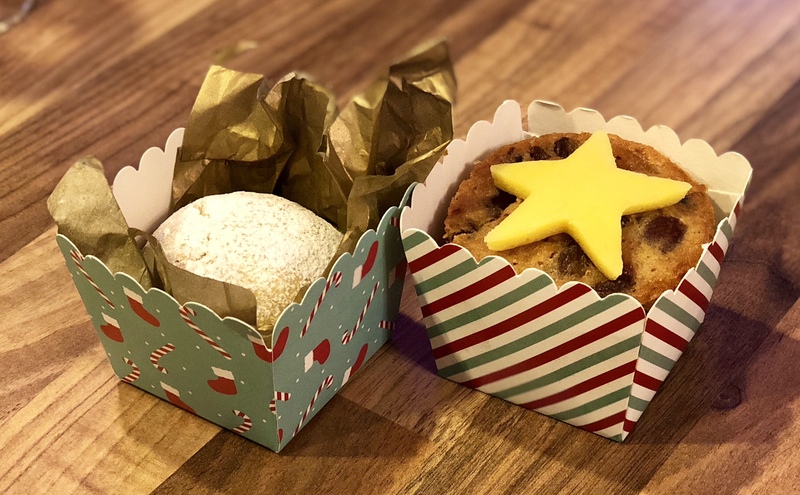 As it’s Christmas we sent our guests home with little take home treats as a gift. These included yet more humongous shortbreads and a mini Christmas cake topped with a marzipan star. Nigel has a few cake recipes in the book, and this basic one is a light fruit cake that focuses on fruit and citrus zest rather than spice. So if you’re not a Christmas cake fan, you might still like this. So that’s it for this year. We do technically have a Georgian lunch in early January – unless Susie gives birth early! In which case I might have to weigh up how much I can do on my own! Although I’ve had lots of lovely offers of help, so I might be ok! In terms of the rest of 2018, we’re likely to be back once Susie has settled into motherhood. In the meantime I’m in the process of setting up some events with a twist for Feb and March. I’ll be going on tour in the North Leeds area, as a big proportion of our customer base is from there. It’ll be the same Manor experience but in an exciting new venue. Watch this space for ticket details. I’ll try and get these out before Christmas in case people want to buy tickets as a present for a loved one. If you’re not already signed up to the blog then make sure you do as that’s the best way to be alerted once tickets go on sale. 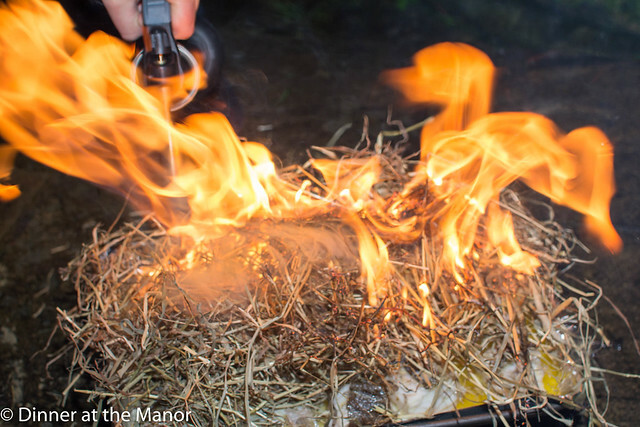 This entry was posted in Past Events and tagged 2017 Dates, Dinner at the Manor, food, Leeds, Nigel Slater, secret supperclub, Supper Club, supperclub, Underground Dining, Underground Restaurant, Yorkshire on December 14, 2017 by martinimanleeds. This coming weekend we’ll be hosting two consecutive evenings where we’ll be celebrating all things Christmas! Using Nigel Slater’s beautiful book The Christmas Chronicles as our inspiration we’ll be cooking up a number of not-so traditional festive treats for our diners. We’re really looking forward to bringing some Christmas cheer and spirit at the weekend. We’d love to know what you think. 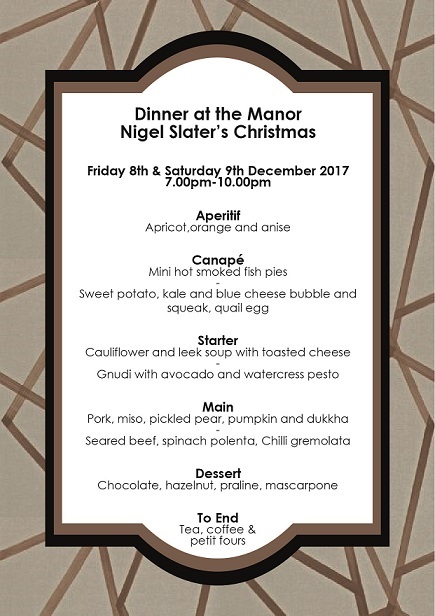 This entry was posted in Menus, Upcoming Events and tagged 2017 Dates, Dinner at the Manor, food, Leeds, Menu, Nigel Slater, secret supperclub, Supper Club, supperclub, Underground Dining, Underground Restaurant, Yorkshire on December 5, 2017 by Susie Barker. Our guests were offered a welcome drink of pomegranate tea fizz – this was deliciously sweet and fruity pomegranate tea from T2, combined with sparkling prosecco. The combo really worked and could be a great alternative to bucks fizz at Christmas! We didn’t avoid savoury dishes completely – instead offering up a smaller selection to whet the appetite. These included some pan fried corn cakes, topped with tomato salsa and a fried egg. A spicy, tangy mouthful which was brought together nicely by the soft egg yolk. 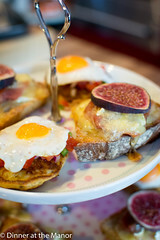 The next savoury wasn’t actually Ottolenghi inspired, but more Nigella with our brie, fig and Parma Ham toastie. A delightful combination of creamy, salty and sweet! Our final savoury was a beautiful aubergine tart that Dan’s made before and couldn’t resist whipping up again as it’s so reliable and tasty. Homemade puff pastry encased baba ghanoush, griddled rounds of aubergine, roasted wedges of aubergine, halloumi cheese and a drizzle of mint, honey, preserved lemons, chilli and walnut syrup – literally all the flavours in one tart! So, onto the onslaught of sweet delights! First up were some smaller bites, starting with little rhubarb and custard yo-yos, which were basically custard powder shortbreads with a sweet rhubarb butter cream. Homemade flaky pastry cases filled with a chai custard and topped with a burnt sugar brulee. And an off-menu extra of tahini and halva brownies – all gooey and not overly sweet due to the nuttiness of the sesame paste. 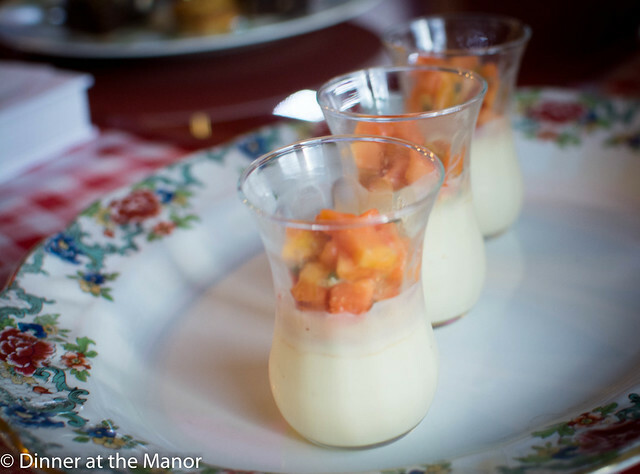 Next up were little palate cleansers – servings of kafir lime possets topped with a papaya salad. 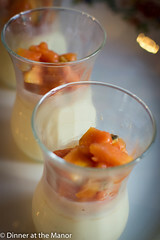 These weren’t as sharp as a traditional posset but the tropical salad worked well to cut through the cream. Moving onto the “cake” menu were a trio of bakes, starting with some naughty banana cakes topped with a rum caramel. These pretty little bundts were basically a cross between banana bread and sticky toffee pudding. We added a bit of butter to the caramel sauce to make it even more luxurious. 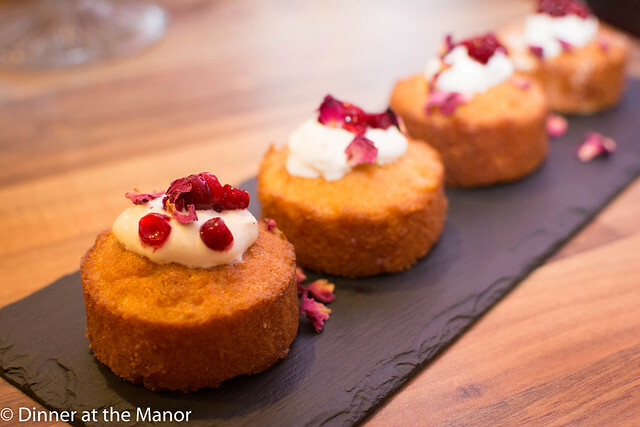 Next were the Persian Love Cakes – legend has it that a young woman was madly in love with a Persian prince and in an attempt to win his love, made him a cake packed with magical love powers. 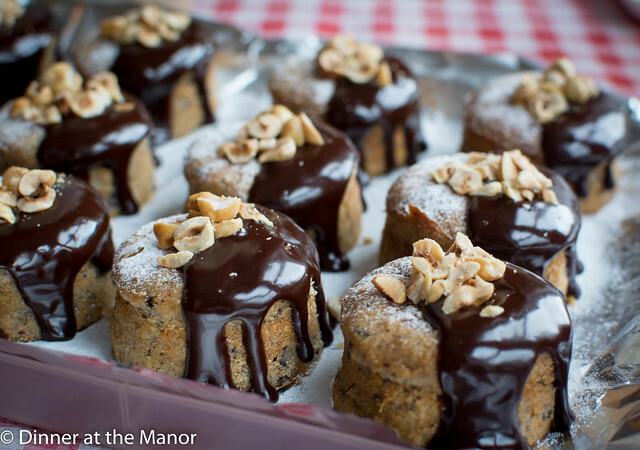 Now we can’t say there was any love in the room that afternoon, but the cakes, heavy with nutmeg and almonds did bring some joy to our guests! 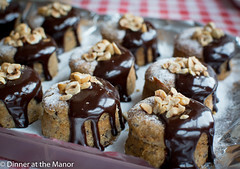 The last in the trio of cakes were little hazelnut, ricotta and chocolate cakes. Individual baked cheesecakes of ricotta, ground hazelnuts and chocolate, topped with a shiny chocolate glaze and roasted hazelnuts. Nutella fans will love this one! If this wasn’t enough, then our finale was a massive blackberry and peach meringue roulade! A crispy yet pillowy and chewy meringue, slathered in cream and fruit and then rolled and covered in more cream and fruit. A brilliant take on a classic dessert. Safe to say our guests were full and happy. We may have tipped them over the edge a little, but our motto has always been it’s better looking at it than for it! Our next events are in just over a weeks’ time, where we’ve improved our theme from Rick Stein’s Mexico to a more festive Nigel Slater’s Christmas Chronicles. We’ve picked the menu which we’ll be sharing very soon and all we can say is, it’s going to be a good one! This entry was posted in Past Events and tagged 2017 Dates, Afternoon Tea, baking, cakes, Dinner at the Manor, Leeds, Ottolenghi, Undeground Tearooms, Underground Dining on December 1, 2017 by Susie Barker. Oklava – 6th Birthday Supperclub! It’s now six years since we started running a secret supperclub in Leeds and each October we like to cook an extra special menu to celebrate. This year we took inspiration from our current favourite chef – Selin Kiazim, of Oklava fame. Selin cooks super modern/fusion Turkish Cypriot food that scored her the winning dessert dish at this year’s Great British Menu. Oklava (named after the rolling pins used to roll out dough and pastry) is her flagship restaurant in Shoreditch and we were keen to bring the lovely flavours of this establishment to Leeds for the weekend. The Oklava recipe book is lovely – full of flavour and colour that excites you into cooking. Some of the recipes might seem a bit daunting but if you follow Selin’s pragmatic step by step approach then it’s foolproof. Some of the ingredients may seem a bit alien, but if you’re Leeds based then we can’t speak more highly of Holbeck’s Venus Foods – which is an Aladdin’s cave of Turkish and Mediterranean cuisine. You may get a bit lost amongst the shelves but go with a clear list and you won’t be disappointed. For our welcome cocktail we served up Oklava’s sweet and sour sumac and pomegranate martini. Vodka was infused with bitter sumac and then mixed up with rum, pomegranate tea, pomegranate juice and lime juice. 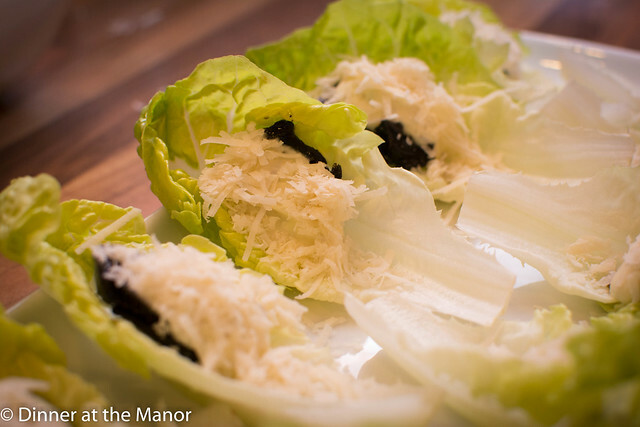 The first canapé was a simple but effective lettuce cup filled with candied walnuts, a dressing made from lemon, honey and feta and a pinch of parmesan cheese. This was sweet and salty at its best. The walnuts are candied whole with their shells (a bit like a pickled walnut but sweet). It creates a musky, maple flavour that is heavenly. The starters included a pretty salad of sour cherry, pearl barley, chilli butter, yoghurt and kale, topped with sheep’s cheese (in this case pecorino) This unique dish was crispy, creamy and chewy all at once, with sweet, salty and sour notes. 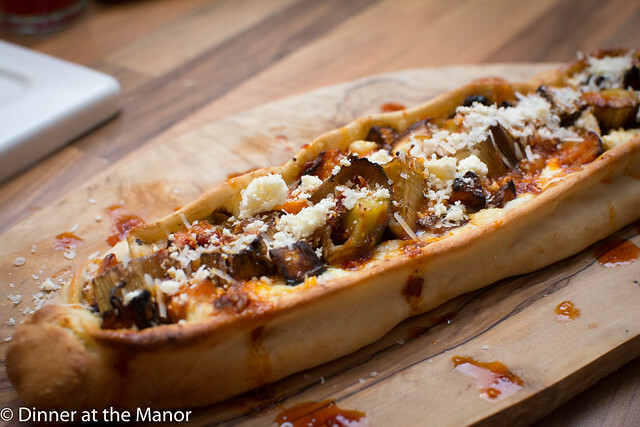 I couldn’t resists cooking up one of Oklava’s pides. When I visited the restaurant earlier this year it was the best thing I ate there, and is possibly the nicest thing I’ve eaten all year. Essentially it’s a folded pizza but with a lovely little peek at what’s inside. I filled mine with a filthy 5 cheese sauce – the cheeses being helim, Parmesan, mozzarella, feta and a Cypriot cheese called Tulum – it’s a stinky, hard cheese that comes in a jar. This was topped with toasted walnuts for crunch and chunks of charred pumpkin and leek that gave a beautiful sweetness against the salty cheeses. These were baked at the highest possible temperature to get the crust nice and crispy. WhatBefore being served they were doused with a smoky harissa oil and more Tulum cheese. The harissa oil really helped lift the pides from their savoury depths! The fish course was a beautiful piece of cod anointed with a pretty green crust of sweet pistachio and served with lashings of preserved lemon butter sauce, which was salty, slightly bitter and very naughty! 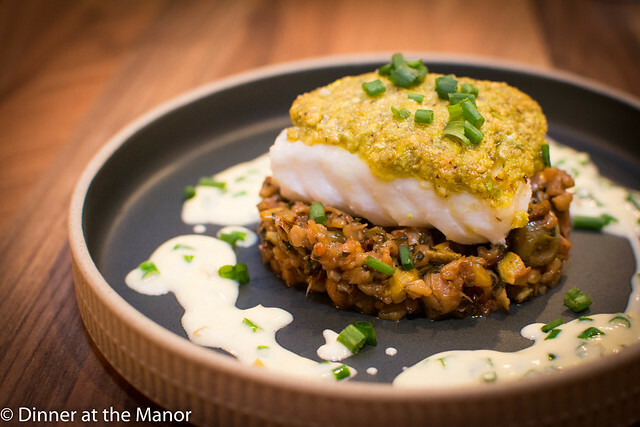 It came atop a bed of buttered freekeh, which was a lovely savoury accompaniment to the sweet fish and creamy sauce. Freekeh is an Egyptian grain that gets dried over open fire, giving it the most incredible smoky flavour. This was cooked with lots of butter, green olives, barberries, chickpeas, pistachios, mint and parsley. 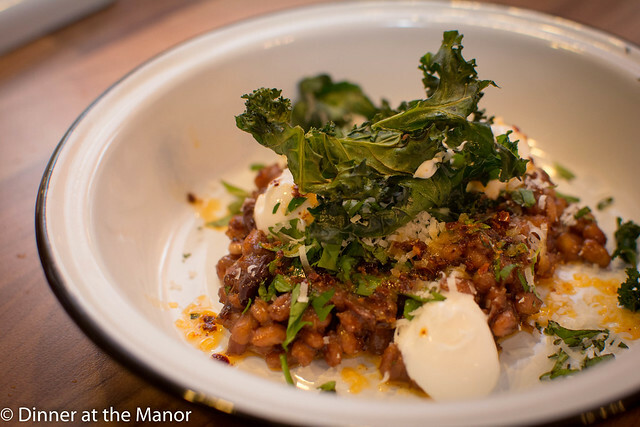 The meat course was a rich ragu of braised beef short ribs in çemen – a turkish spice paste of fenugreek, cumin and paprika. This was served on a rich, thick bread sauce with charred hispy cabbage. To finish this was drizzled with chilli butter and mint jelly to add some acidity. A brilliant spiced, hearty, autumnal dish. 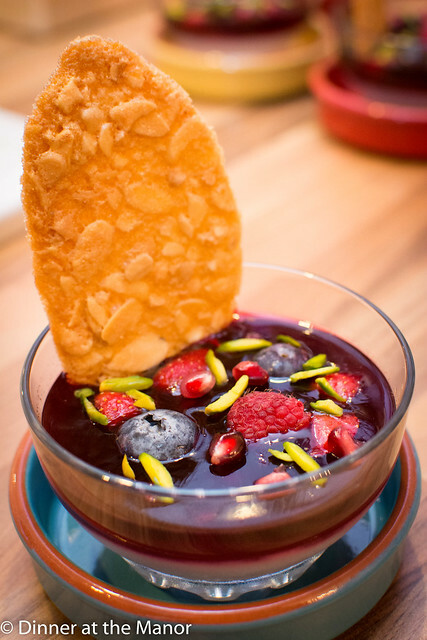 For dessert we took on the challenge of recreating Selin’s famous and award winning dessert – muhallebi and jelly. Muhallebi is a milk pudding thickened with cornflour (or blancmange to you and me!). 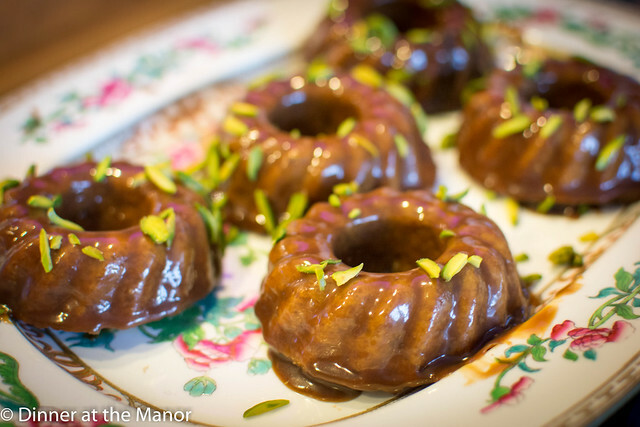 I flavoured mine with vanilla and pistachio extract. The jelly was flavoured with forest fruits, pomegranate, sumac and rosewater. 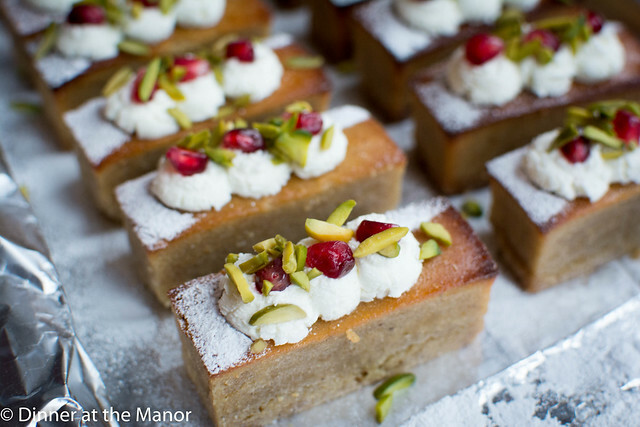 These were prettily decorated with berries and slivers of pistachio. It was a very ‘soft’ dessert and so to create a bit of texture I threw in a brown butter and almond tuile, courtesy of Ottolenghi’s ‘Sweet’ book. These biscuits had a beautiful crunch that worked perfectly with the creamy, fruity dessert. Finally our petit fours were semolina custard boreks. 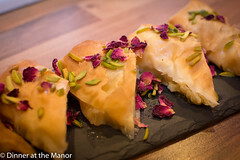 Similar to Baklava in method, these were filo pastries doused in sweet syrup, but filled with a set semolina custard. a sweet way to end the meal. All in all it was a successful event. Usually by the end of a weekend of cooking I am sick of the book we have been using as our inspiration, but this not the case with Oklava, I cannot wait to cook from it again! Next up we have an afternoon tea using Ottolenghi’s ‘Sweet’ as our muse. Given there are no savoury recipes in the whole thing, guests can expect a very sugary affair indeed. I’ve been on a diet the last four months so I’m a bit worried about having to test these recipes! This entry was posted in Past Events and tagged 2017 Dates, cypriot food, Dinner at the Manor, food, Leeds, Middle Eastern Food, Supper Club, supperclub, turkish food, Underground Dining, Underground Restaurant, Yorkshire on November 10, 2017 by martinimanleeds. When we had the crazy idea to start up a supperclub back in 2011, we didn’t know how long we’d do this for or if anyone would want to come! Untrained, home cooks inviting strangers to share an evening of food and drink? Scary stuff. However, we needn’t have worried and 6 years later we’re still going strong, went on a huge learning curve, made loads of improvements and we’re the longest running supperclub in Leeds. Wow! We’ve had around a thousand guests round our table which is quite overwhelming, but hopefully we’re doing something right. At the weekend we’re celebrating our 6th birthday and using one of our favourite books / restaurants / chefs as our muse, Selin Kiazim. 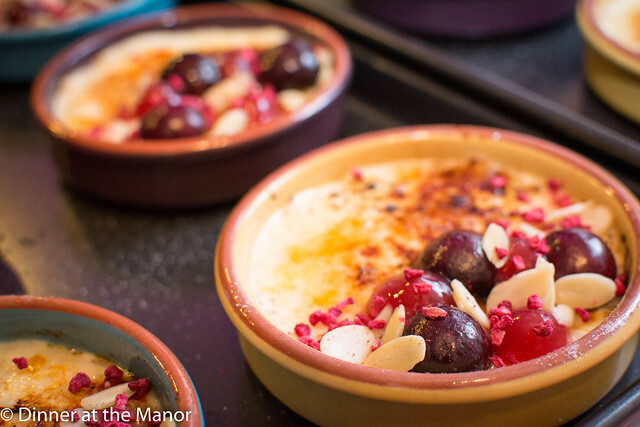 We’ll be cooking up an array of Turkish-Cypriot delights across a number of small plates. This entry was posted in Menus, Upcoming Events and tagged 2017 Dates, Leeds, Menu, Supper Club, supperclub, supperclub. 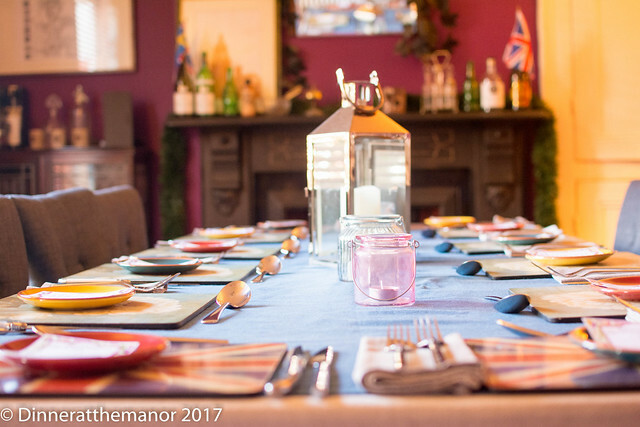 private dining, supperclubs, Yorkshire on October 24, 2017 by Susie Barker. 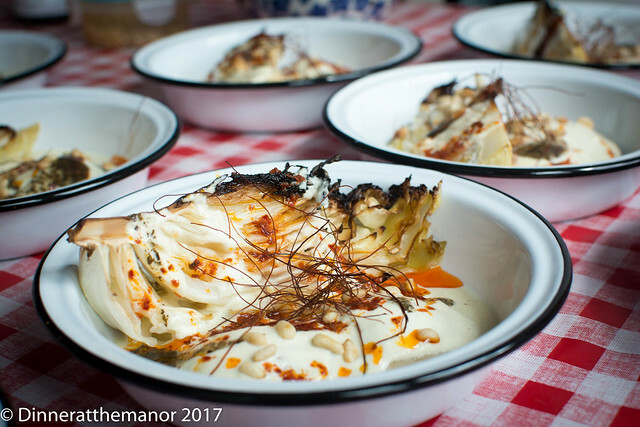 It’s a couple of weekends ago now but at the end of September we brought hygge to the Manor through our Scandinavian Comfort Food events. 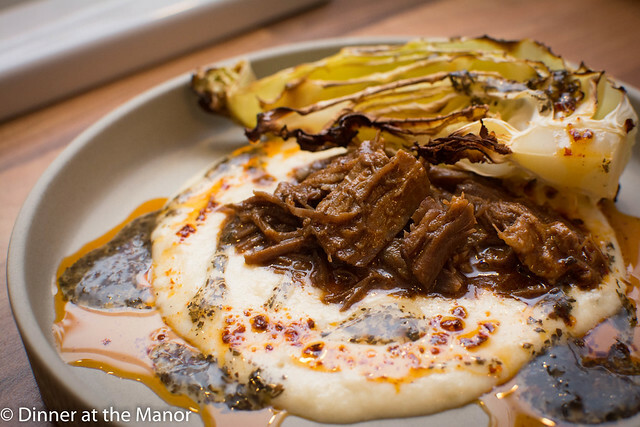 We love anything Scandi and the dishes we prepared seemed an apt way to welcome in Autumn. We used some of our favourite Scandi cookbooks as our inspiration. 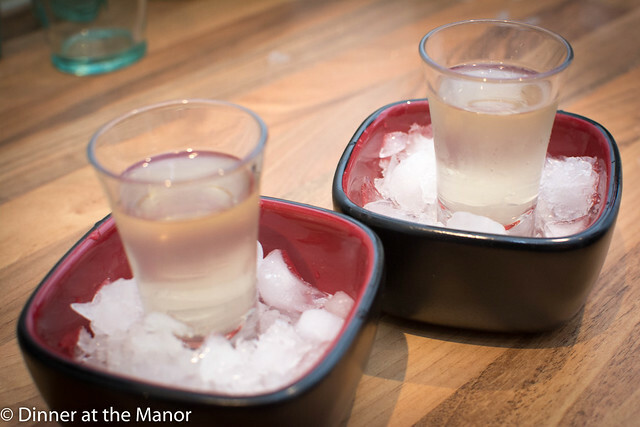 I wanted to serve aquavit to guests as a welcome tipple, but subsequently couldn’t find any that wasn’t going to break the bank – so I made my own! It’s actually pretty easy to do – simply infuse a good quality vodka with lemon peel, dill, star anise, caraway and fennel seed. It only needs a few days and then strain and chill. It does pack a punch, but I like my booze to be adult! 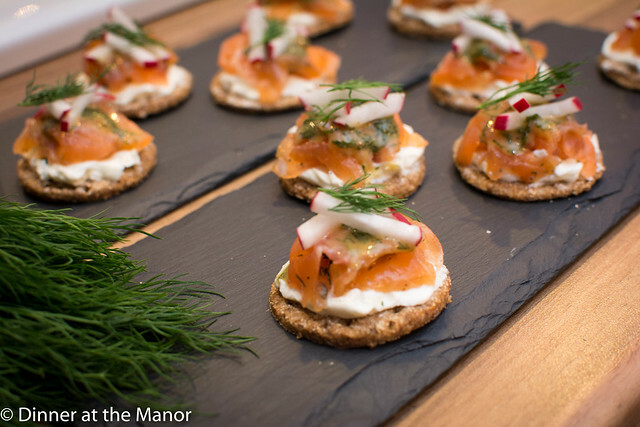 Our canapés were home cured gravadlax on little rye crackers, served with a creamy mustard and dill sauce. A classic Scandi combination. 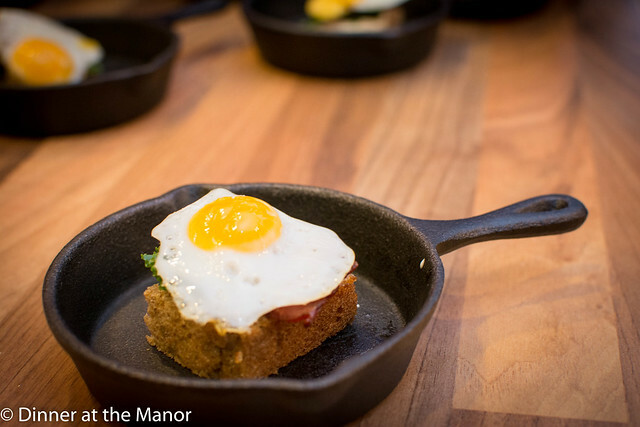 This was swiftly followed by a cute little frying pan holding a mini open rye sandwich of bacon and quail egg. This was given a Scandi twist with lots of mustard, dill, kale and a dash of truffle oil. 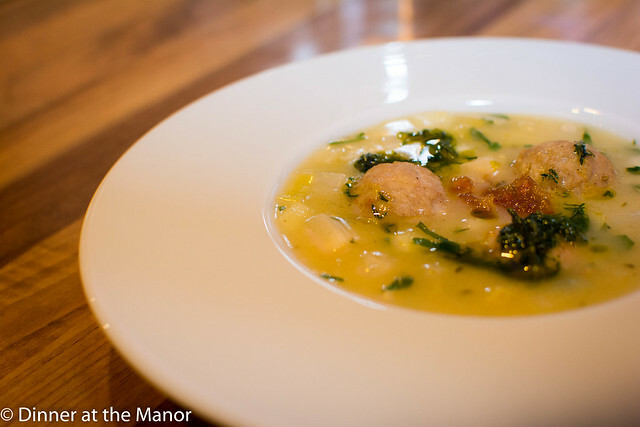 Our first starter was a comforting broth of celeriac and apple and little Swedish meatballs. The meatballs were flavoured with fennel and nutmeg and the broth was finished off with a pretty green dill oil and tangy cloudberry jam. 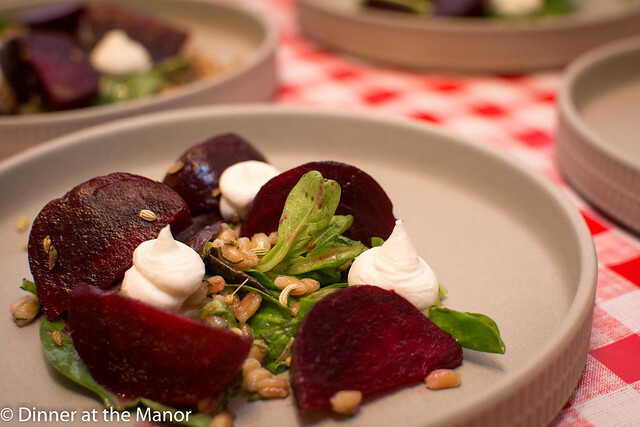 Next up was a light salad of roasted beetroot, pearled spelt and whipped goats cheese topped with hazelnuts. Another traditional combination, but a riot of vibrant colours, textures and flavours spiked with fennel and raspberry vinegar. The fish course came courtesy of our Swedish food crush Niklas Ekstedt. In his amazing Stockholm restaurant he cooks everything over open fire and it’s one of the best meals we’ve ever had. His book is lots of fun, but not particularly accessible. 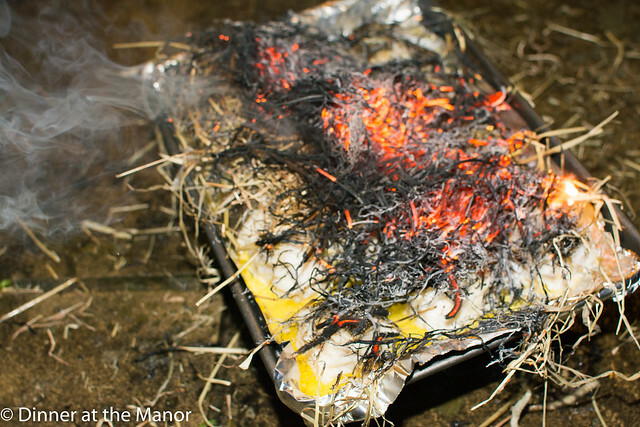 I did his hay flamed cod – gently roasted cod was covered in hay at the last minute and then blowtorched. This imparted a lovely smoky flavour and the odd bit of sweet ash! This was served up with a filthy brown butter sauce and potatoes roasted with miso. Pickled cucumber with pink peppercorn helped cut through the extreme sweetness. The flavours were a great balance of sweet, salty, sour and umami. It’s a very special dish that I’ll cook again next time I want to show off a bit! There was lots of plate licking action in the dining room. 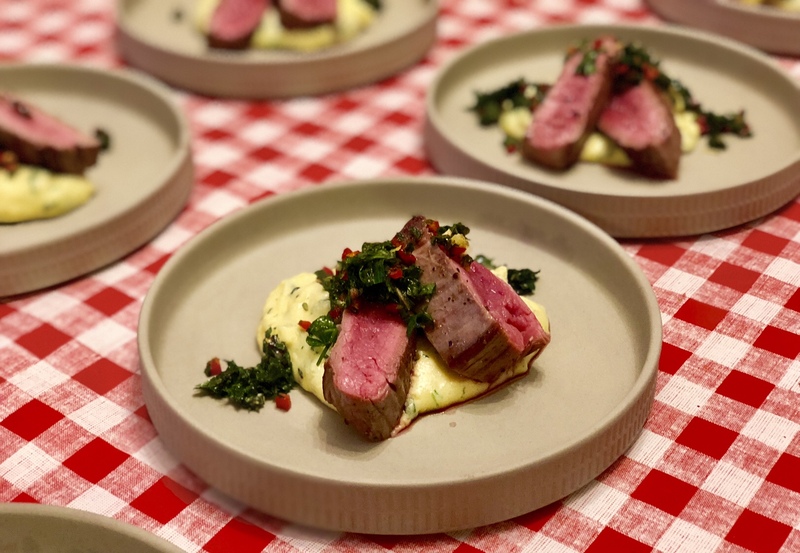 The meat course was a rye crusted lamb leg, boned and rolled then coated in a herb and mustard rye crumb crust, served with a classic Swedish Jansson’s temptation. Floury potatoes, cut into matchsticks, with fried onions, thick cream and the umami boost of pickled sprats (Swedish anchovies) baked in the oven. To cut through the rich lamb and the creamy potatoes, this was served with a simple salad of kale and lingonberries. A little early, but it looked like Christmas on a plate! Finally our not so petit fours were mini marzipan cakes. These were nutty, sweet, moist and chewy and topped with a light crème fraiche frosting and some lingonberries – the perfect fika treat with a coffee! Next up will be our 6th birthday event, a foray into Cyprus and Turkey, courtesy of our other food crush Selin Kiazim of Oklava. We’ve already started planning the menu and hunting down the obscure ingredients so watch this space for more news of that! 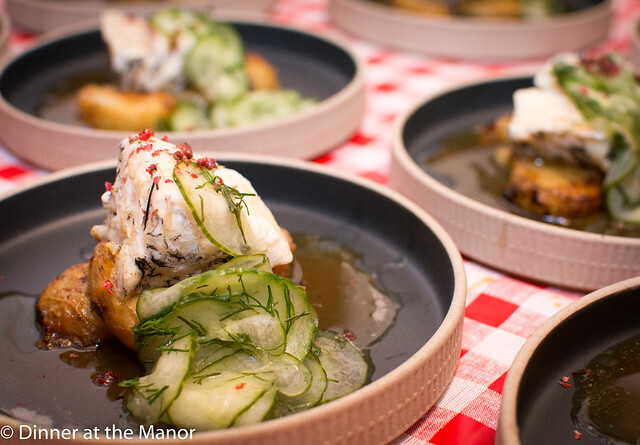 This entry was posted in Past Events and tagged 2017 Dates, Dinner at the Manor, Leeds, Scandinavian Food, secret supperclub, Supper Club, supperclub, Underground Dining, Underground Restaurant, Yorkshire on October 15, 2017 by martinimanleeds. Last weekend we went completely vegetarian. We always aim to cater for all dietary requirements at the Manor but we like to put the veggies first every now and then. I used to be a veggie when I was a student so I don’t really feel like I’m missing out if I don’t have meat. 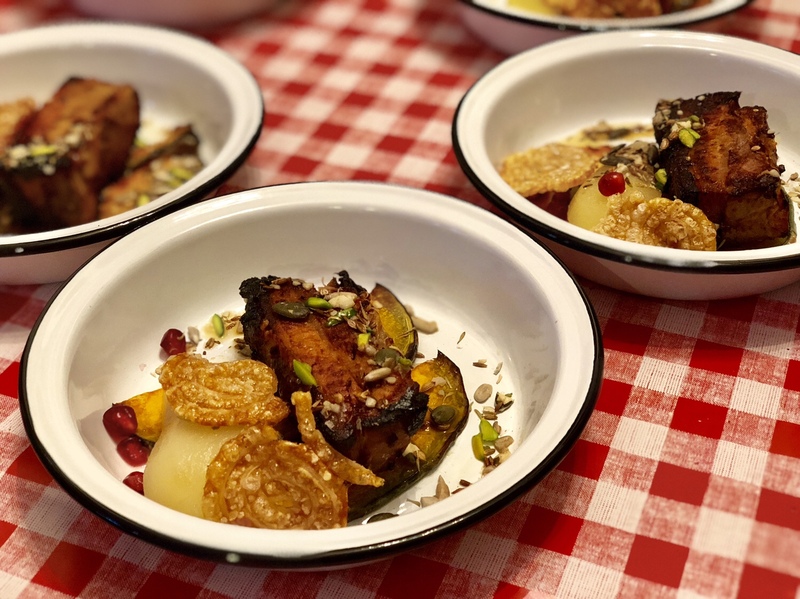 I think these days vegetarian food has a much better reputation, helped by the exciting flavour combinations people are prepared to experiment with – as demonstrated by the likes of our foodie friends at Swine that Dines. They do a monthly veggie small plates menu where I’ve eaten some of the best food of my life. Flavour is probably the most important aspect of cooking for me, and so we picked a menu that would showcase some strong, spicy and unusual flavours, all in veggie form. In fact most dishes were actually vegan or could be made vegan by omitting the minor dairy elements. People seemed up for it as well, at least two thirds of the crowd were not even vegetarian! Susie got me a spritz book for my birthday this year and so I’m slowly making my way through it at each supperclub, as the recipes produce such lovely, refreshing aperitifs. This month I picked a Nero Chinato spritz, which was muddled blackberries, cocchi and prosecco. Very late summer inspired! 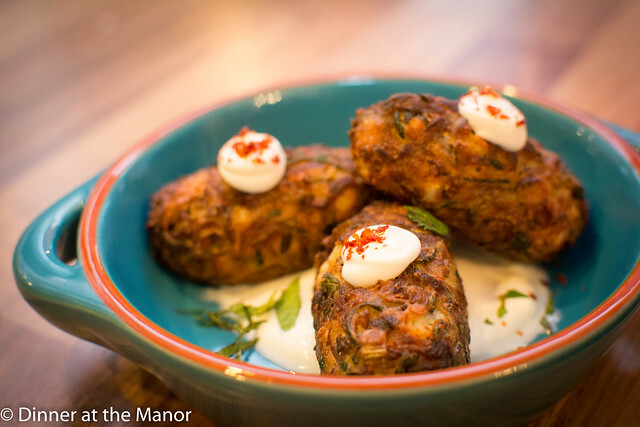 Our canapes started our veggie tour of the world, the first being ullunde vadi – Sri Lankan street food inspired by my recent travels. 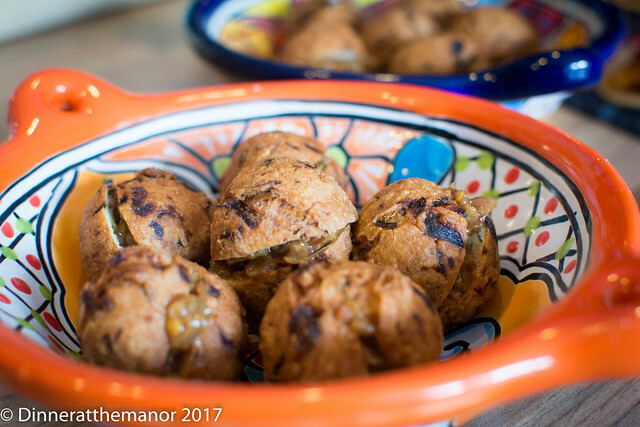 These chewy little lentil doughnuts came stuffed with a punchy, sweet and sour onion and chilli relish. Then it was onwards to Mexico with a smoky butternut squash tostada. 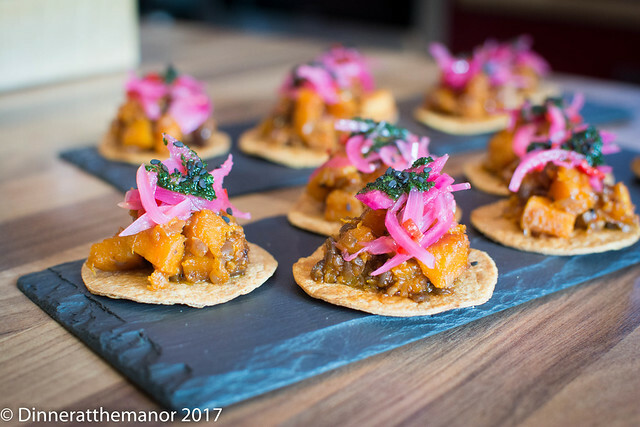 A crunchy tortilla topped with spicy paprika spiked squash, topped with pink pickled onions and coiander oil. Next on our culinary tour was Turkey. 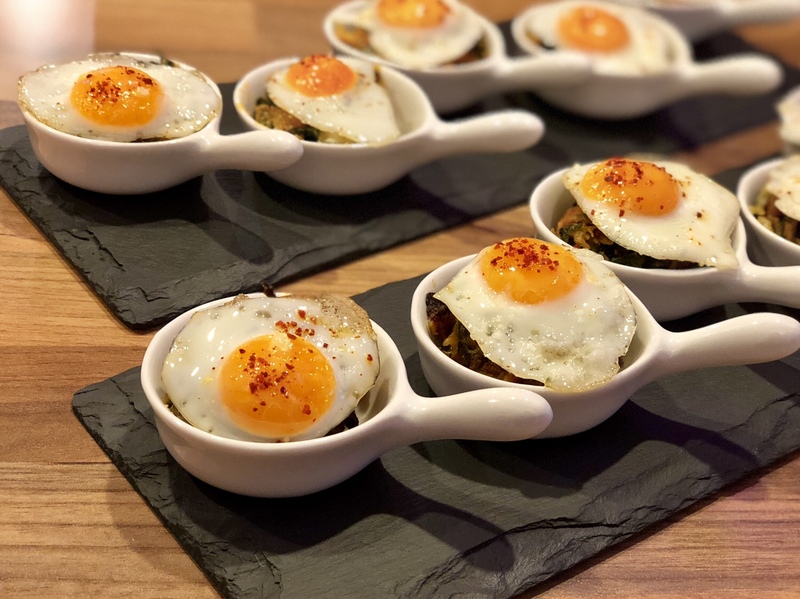 We’ve said before how our current food obsession is Selin Kiazim of Oklava and so I was keen to test a recipe ahead of our Oklava themed event in October. Ricotta stuffed dumplings came paired with a charred wedge of cabbage, a naughty yoghurt and cream sauce, chilli butter and toasted pinenuts. The sauce could essentially make anything taste nice and the spicy chilli butter cut through all the dairy richness. Next was a detour to Asia via Greece with a real fusion of a salad consisting of black rice, aubergine, watermelon, feta and sesame! 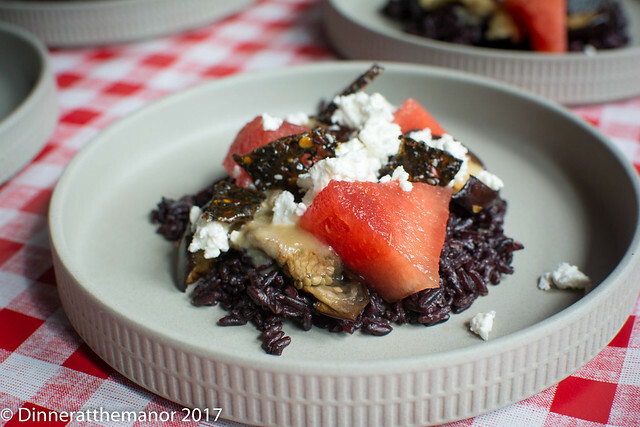 Black rice and griddled aubergines were tossed in a salty, umami miso,ginger and lime dressing and then topped with feta, watermelon and a chilli sesame caramel brittle. The salty savoury flavours were washed away by the watermelon, leaving you ready for another mouthful. 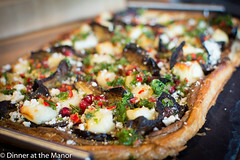 This combination sounds bonkers, but our guests seemed to love it! My Middle Eastern take on a risotto was up next and was packed full of unusual flavours including sumac and preserved lemon. This was topped with little bread and butter pickles, made from tiny Turkish cucumbers. 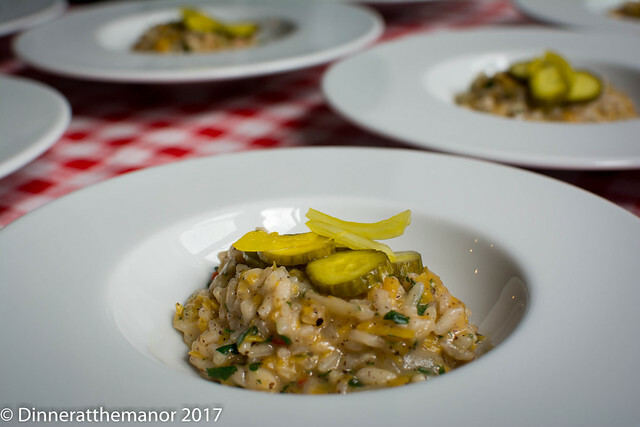 The tart little pickles cut through the creaminess of the risotto and provided a lovely crunch against the comforting softness. 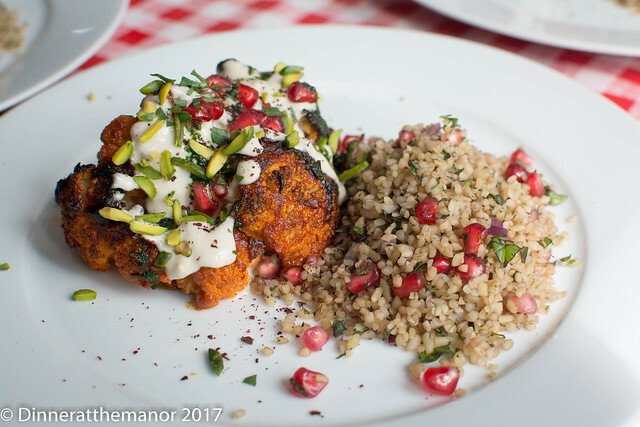 We stayed around the Middle East for Susie’s take on another of Selin’s recipes – chilli roast roast cauliflower. Smeared with sweet and spicy Turkish pepper paste, the cauliflower was roasted and charred and then topped with a tahini sauce, pistachios and pomegranates. A herby bulghur wheat salad accompanied. Roasting cauliflower really brings out the nuttiness of the vegetable yet retains the bite. 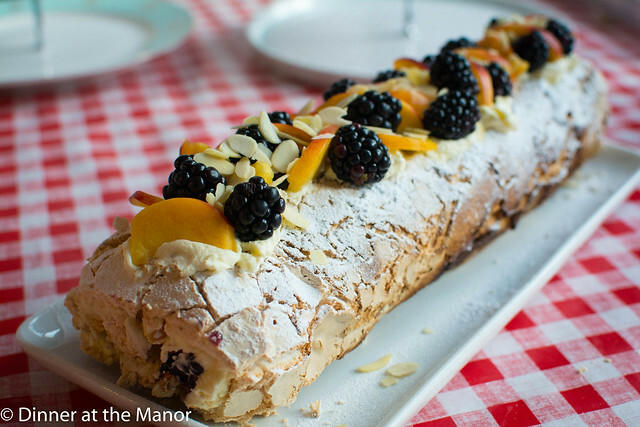 And then it was back to the UK for dessert – using a dessert recipe from Edinburgh’s Mark Greenaway. Mark’s recent book ‘Perceptions’ is full of complicated Michelin starred recipes, most of which I will never try. However the dessert section is very colourful and appealing and he breaks down all the steps in a (fairly) accessible way. I tried out the brown sugar cheesecake, bramble sorbet and tomato caramel. This was a beautiful little dish full of unusual flavour combinations. 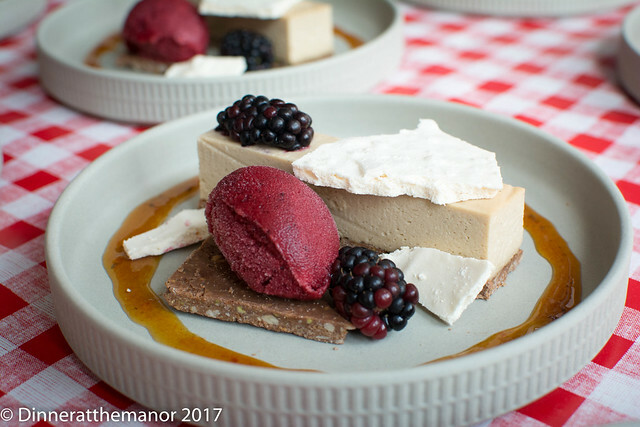 The brown sugar cheesecake was creamy and light and with a touch of butterscotch; the bramble sorbet full of summer hedgerow flavours; and the tomato caramel surprisingly fruity and zesty. It was a bit of a labour of love, but worth it! And so we proved vegetarian food can be as exciting and fulfilling as anything else, we certainly didn’t miss the meat! Next up is our Scandinavian double bill at the end of September, where we will probably be welcoming in the start of Autumn. You’ll also no doubt have seen that we’ll be taking a wee break after January so that Susie can go on maternity leave (not my baby I hasten to add!). If you’ve managed to book on to our last round of events, then well done! If not then keep an eye on the blog and on twitter as we’ll advertise any cancellations as they arise. 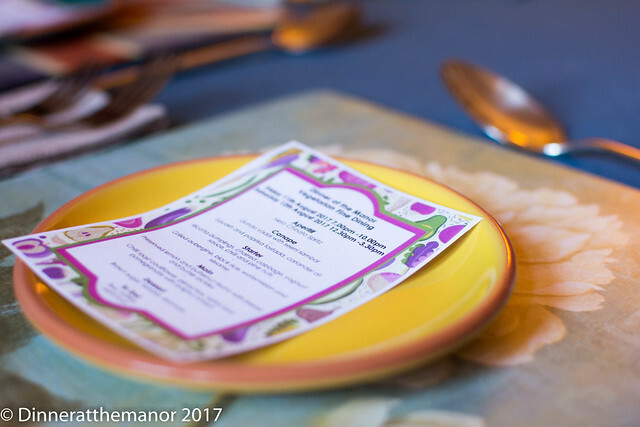 This entry was posted in Past Events and tagged 2017 Dates, Dinner at the Manor, fine dining, food, Leeds, secret supperclub, Supper Club, supperclub, Underground Dining, Underground Restaurant, Vegetarian, Yorkshire on August 20, 2017 by martinimanleeds.